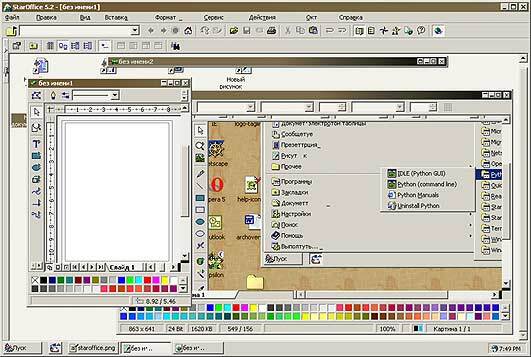 I installed and played for sometime with Sun's StarOffice Version 5.2 Russian Edition. It's available for Solaris, Linux and Windows in variety of languages and you can download it for free from Sun's website. Main question for me was - is it a real alternative or not. Yes it is. However while price is very good for 70Mb download, there are many things that far from being satisfactory. To be short on the bad side, I had an idea to create this particular page completely in the StarOffice, and since it's a all-in-one suite I was optimistic about it, but I could not do it keeping quality of my other pages. Not that I would be happy to do it in the MS Office 2000, but still certain things were really bad. For example image resize would not create a slightly blurred picture that is smaller but simply delete some pixels, which looked absolutely horrible after I resized a screenshot to be 531 pixels wide. Lack of other essential options, really put me down. But anyway - to be grateful it's better in many things than expensive commercial products, and it can be combined with other free tools and be a good part of all free working environment. What was really nice is that it can deal with bunch of popular file formats. Another interesting thing is that I got the Russian version and installed it on English Win2K with Japanese as default locale. That is asking for trouble in the first place, but I decided to go forward and see where would it be broken. Most of the places would display somewhat broken Russian, that was readable/guessable but definitely broken, yet better than ???? ??? ?????. So after some straggle I finally switch default locale to Russian and most of the problems got fixed. One of the features that I liked was that (especially if StarOffice is maximized) it can completely replace Windows Desktop, it even has it's own Start Button. Overall it's not bad at all, but I would call it an early beta.